Space weather is a natural hazard that can adversely affect human missions to Mars, primarily through the adverse of impacts of energetic particles on spacecraft systems and on the health of astronauts. 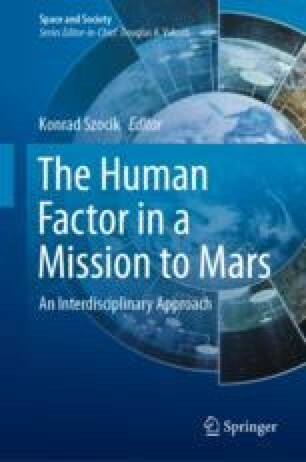 This chapter starts with an overview of these effects, and of their potential to disrupt human missions. This is followed by a discussion of the processes that generate these particles, highlighting that human missions to Mars must consider two distinct classes of particles: a slowly changing low-flux background of very energetic particles originating outside the solar system (galactic cosmic rays) and episodic bursts of high fluxes of slightly lower energy particles originating from the Sun (solar radiation storms). This distinction suggests that mission design should consider a mixed approach to mitigating the effects of space weather: (1) resilient design, including shielding to provide continuous mitigation of effects caused by the low-flux background; and (2) operational measures (sheltering, human troubleshooting) to mitigate the effects caused by radiation storms. The chapter also shows how our scientific understanding of space weather can guide efforts to mitigate these adverse effects: e.g. by flying to Mars when cosmic ray fluxes are lowest; by enabling space weather experts on Earth to provide targeted space weather forecasts so that astronauts are aware of when there is a significant risk that they will encounter a radiation storm; and by flying on-board particle instruments so that astronaut can control how they respond to the actual start and end of radiation storms. Finally, the chapter outlines the observing capabilities needed to support space weather forecasts targeted on human missions to Mars, showing that this will be synergistic with concepts now being developed for better forecasting of space weather at Earth. CDC (Centers for Disease Control and Prevention). (2015). ALARA-As low as reasonably achievable. Retrieved July 29, 2018, from https://www.cdc.gov/nceh/radiation/alara.html. Kolawa, E., Chen, Y., Mojarradi, M. M., Weber, C. T., & Hunter, D. J. (2013). A motor drive electronics assembly for Mars Curiosity Rover: An example of assembly qualification for extreme environments. In 2013 IEEE Reliability Physics Symposium, Anaheim, CA, 2013, pp. 2E.2.1–2E.2.9. https://doi.org/10.1109/irps.2013.6531963. Luntuma, J. P., Kraft, S., & Glover, A. (2018). ESA SSA Lagrange mission to L5 point. Retrieved August 22, 2018, from https://cpaess.ucar.edu/sites/default/files/documents/sww-2018-presentations/Luntama_Juha-Pekka_06.pdf.